Pi Yao, or Pi Xiu, is a popular and potent Feng Shui protection tool that also has the power to increase wealth and overcome obstacles. Pi Yao assists with complex life transitions like a career change or a divorce. It also has wish fulfilling powers. Pi Yao is fat. In Feng Shui, being fat represents having a lot of money. Pi Yao crouches on a bed of Chinese coins, protecting your money. To change your luck from bad to good, add a Pi Yao to your home. 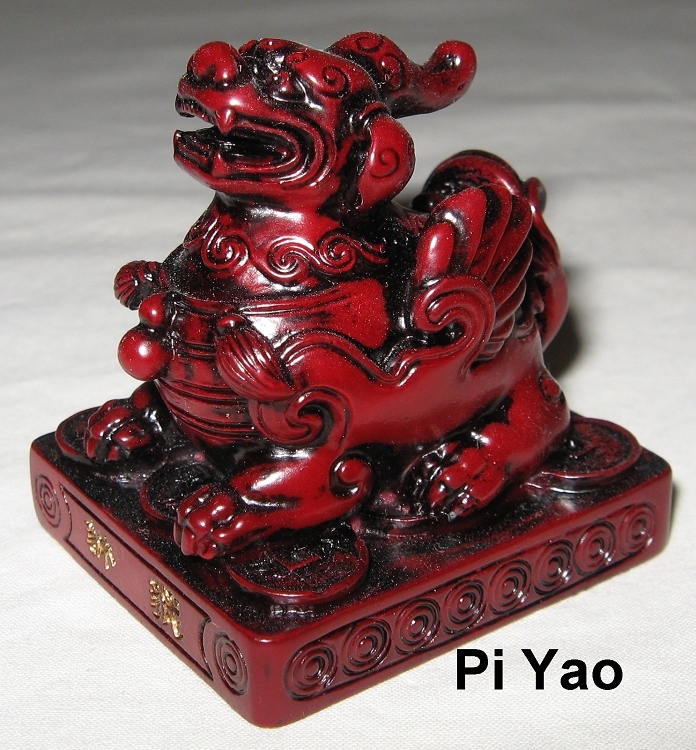 To protect yourself from bad luck after moving to a new home or after remodeling your home, place Pi Yao in your home. To protect yourself and your family from evil spirits of any nature add a Pi Yao to your home. To improve your health, increase your wealth, protect your family, protect yourself when traveling or increase your authority in the workplace add a Pi Yao to your home. Approximately 2 inches high, 2 inches wide and 2 inches deep, glossy burgundy.